why, because I must have photographed these robins more than almost any other bird! Perhaps faced with few options, it seemed like a good idea. Before I'd taken a few steps, it was chased off by a New Holland, but I continued. The light wasn't that conducive for photography, but from previous visits, I knew this spot could be good, so I stood and waited. A succession of New Hollands moved past, as did an Eastern Spinebill and a Yellow-throated Honeyeater. A scolding Brown Thornbill neared, and I had fleeting views of a family of Superb Fairy-wrens, but none close enough for photography. A pair of Grey Fantails caught my eye as they neared, but I would have to say, these are birds that I 'resort' to photographing when there's nothing much happening, so I wasn't that excited. They're fidgety birds, and their erratic behaviour often makes for a difficult subject to photograph in good light, which this wasn't. But I stood still and waited. 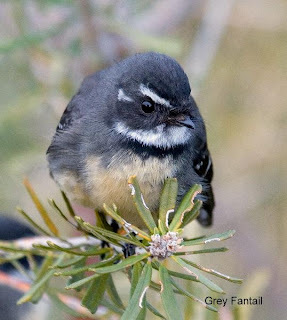 Oneof the fantails made a couple of c lose passes, as if to say "I know you're there", and then a series of events that despite having birded for many years, only happens to other people. It landed on the end of my lens, giving me a warm fuzzy feeling, but no photographs!. I thought that was it, which was quite delightful, but no, it repeated this a few more times, appearing to use the end of the lens as a perch from which to spot insects. Briefly the pair flew off, and I was just about to move on, when they both returned, pirouetting on nearby shrubbery long enough to get a few shots. One bird then landed on my hat, did a few 'sorties' before returning. I can only assume that my presence was disturbing insects, probably midges, and I made a good perch, close to the action. But it wasn't quite done yet. It's last hurrah was to land about half way up the lens, and look staringly at me--eyeball to eyeball! A quite unforgettable moment. It was one of those few times in birding when you feel part of the action rather than a mere observer. While all this was happening, I also managed to get a few shots of another sometimes elusive bird to photograph, a Brown Thornbill, appearing to want to be part of the action too. A magic morning. Good shots of hyperactive species in a natural surroundings. 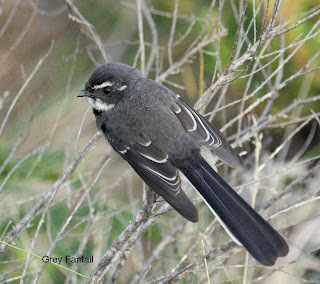 The Grey Fantail is one of my most common garden companions, but I find its love of posing on wire fences frustrating. Thanks for your comments, Penny. I must have hundreds of images of this confiding bird, but there's always a high failure rate. They've "threatened" to land on me before, but this is the first time it's actually happened . More than made up for a 'slow' morning. 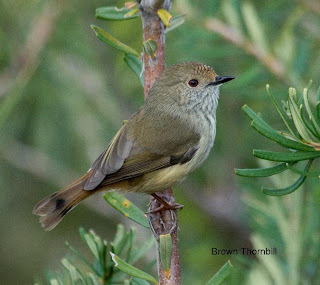 My personal experience shows Grey Fantails as more cooperative, but the Brown Thornbill is nearly impossible to photograph. Thanks Nickolay for your comments. The lack of comment on the story is a bit worrying, perhaps these sort of things happen to birders all the time, just not to me! Am grounded at the moment with acute bronchitis--very nasty, so your comments were all the more appreciated. Wish you a speedy recovery, Alan! Hope the nasty thing goes away as quickly as possible. Now, when away from Tasmania, the only way to stay in touch with the beautiful nature there are the few blogs I'm visiting from time to time. Wonder what he was thinking. I was thrilled to bits yesterday when I got within 2 metres of a Magpie - I'd be beside myself if a little fella jumped on my hat!